The Retreat is excellently positioned to enjoy all that Falmouth has to offer, but set away from all the hustle and bustle of town for when you want to retreat to a cosy and stylish bolthole for two. Just a short walk from the beaches at Swanpool and Gyllynvase – which has an excellent beach café. Falmouth high street is also easily accessed by short walk, where you will find a huge range of fantastic places to eat, from Rick Stein’s and other fresh seafood eateries to excellent pub restaurants and boutique cafes. Days out are easy from here too, there’s a ferry from Falmouth to St Mawes for exploring the Roseland, or a short drive to Trebah and Glendurgan for the lush and paradise like sub-tropical gardens. Penmere train station is nearby too, the branch line takes you to Truro for mainline services between Penzance and London Paddington. Refurnished to a high standard, perfect for couples, The Retreat has a comfortable living room with plush carpet, two sofas and a large flat screen TV. The fitted kitchen features built-in appliances including electric oven and hob, dishwasher, fridge, microwave and a kettle and toaster. There’s also a breakfast bar and even a wine cooler. Upstairs the bedroom is outfitted with a king-size bed, bedside tables and lamps, wardrobe and cuddle chair. Views from this room look over the garden and out toward Budock Water and looking to the left has sea glimpses beyond Swanpool. The bathroom has both a bath and separate shower, handbasin and WC. Also upstairs is a perfect spot for catching up on emails or it could be used as a dressing table instead. Outside is a sun-catching patio, perfect for sitting out with an evening drink and if the cold sea isn’t for you then the swimming pool is also perfectly positioned for soaking up the sun, it’s heated from June to August too! With central heating and modern appliances The Retreat is very well-equipped for year round comfort. 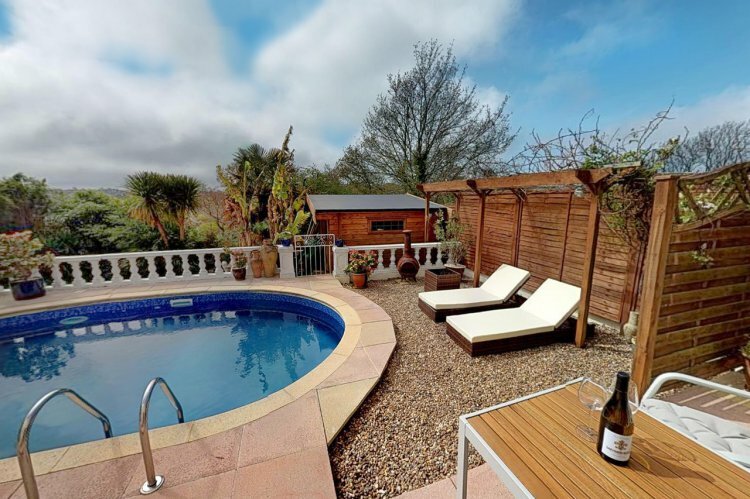 Previously run as a holiday home prior to refurbishment and with the owners living in their private accommodation next door so guests can be rest assured of a welcoming stay. Rental includes bedding, towels, Wifi and driveway parking for one car.